The brutal ramifications of the Hillary Clinton-assisted Honduran coup that took place in 2009 are coming into sharper focus. 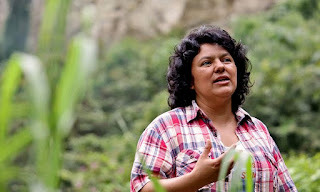 Today, the Guardian reports that Berta Cáceres, the environmental activist, Lenca leader, and Goldman Environmental Prize winner who was found shot dead in her home in March 2016, was on a hitlist given to US-trained special forces. Cáceres is regarded as a hero by many Hondurans, most saliently the poor and indigenous peoples whose land and resources she fought to protect. And before his ouster in the illegal 2009 Coup, when he was dragged from his bed at gunpoint and flown out of the country, then-president Manuel Zelaya had been a strong supporter of movements, by Cáceres and others, that recognized the rights of rural and peasant peoples and peacefully resisted the multinational corporations attempting to seize said land and resources for mining and biofuels. 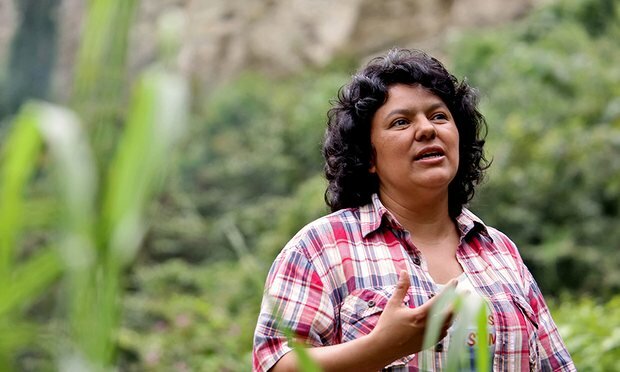 Berta Cáceres gave her life to fight that government. [translated] We’re coming out of a coup that we can’t put behind us. We can’t reverse it. It just kept going. And after, there was the issue of the elections. The same Hillary Clinton, in her book, Hard Choices, practically said what was going to happen in Honduras. This demonstrates the meddling of North Americans in our country. The return of the president, Mel Zelaya, became a secondary issue. There were going to be elections in Honduras. And here, she, Clinton, recognized that they didn’t permit Mel Zelaya’s return to the presidency. There were going to be elections. And the international community—officials, the government, the grand majority—accepted this, even though we warned this was going to be very dangerous and that it would permit a barbarity, not only in Honduras but in the rest of the continent. And we’ve been witnesses to this. Every other country in the world or in Latin America was demanding the restitution of democracy and the return of Manuel Zelaya. It was Clinton who basically relegated that to a secondary concern and insisted on elections, which had the effect of legitimizing and routinizing the coup regime and creating the nightmare scenario that exists today. I mean—and it’s also in her emails. The real scandal about the emails isn’t the question about process—you know, she wanted to create an off-the-books communication thing that couldn’t be FOIAed. The real scandal about those emails are the content of the emails. She talks—the process by which she works to delegitimate Zelaya and legitimate the elections, which Cáceres, in that interview, talks about were taking place under extreme militarized conditions, fraudulent, a fig leaf of democracy, are all in the emails. The young (and understandably terrified) sergeant, Cruz (his pseudonym), says he and his troop, including the lieutenant, did not want to kill the Hondurans on the hitlist; they have since fled the country. A few days later, the lieutenant left the base and has not been seen since.Human rights groups have condemned US support for Honduran security forces amid mounting evidence implicating police and military in systematic abuses. In April, activists warned Congress that death squads were targeting opposition activists, much like they did during the “dirty war” in the 1980s. A reminder: American taxpayers are footing the bill for most of this unutterable brutality. I doubt that much, if any, of the Berta Cáceres story will warrant as much as a brief mention on American cable news, especially not at the "Place for Politics" ("News, video, and progressive community. Lean forward!"). Certainly I won't expect to see much from the gatekeepers who've apparently already chosen the next president of our so-called "democracy", so sit down and shut up, Bernie Bros (even middle-aged, not-male Bernie Bros like Yours Truly). But I wanted to get this important, disturbing story out there as best I can. As I have said before, my feminism extends beyond US borders. You're not feminists. You're #FemiNOTS.